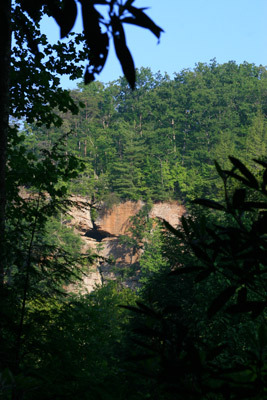 I recently went on a camping/climbing trip to Kentucky’s beautiful Red River Gorge. When we arrived in Slade, it was already dark and we set up camp and turned in for the night fairly quickly. But when we awoke the next morning, it was one of those mornings that seems like it’s shrouded in mystery and magic. The air was thick with steamy fog, and the trees were reduced to mere shadows of their majestic selves, coming into view only as you waded your way through the thick mist into the forest. When the fog finally did clear, we were left with stunning views like the one above — colorful rock jutting out of the foliage to bask in the sun’s warm liquid shine. Of course, we were there to climb, and the rock was the main attraction. It’s sandstone (often beautiful reddish sandstone, which I’m guessing is where the Red gets its name), and in some areas the sandstone is laced with iron which creates some very unusual and intricate patterns in the rock. 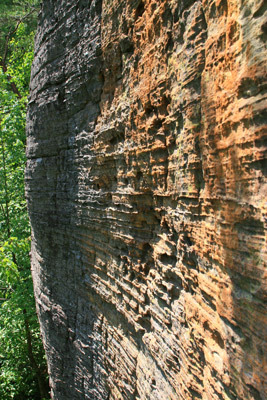 As you can see in the picture below, the rock itself is full of pockets — fingerholds and jugs of various size and depth, which makes the Red a good place for climbers of most skill levels (although there’s some great stuff here for those of you who are far more advanced than me). In many areas, we found ourselves blissfully shielded from the midday sun by the dense plant life above and around us. It was a temperate day, even if it was quite humid, which made for good spirits and good climbing. We visited a few different walls that represented some of the Red’s most canonical spots before heading to the most famous spot of all: Miguel’s. That’s right, the most famous place in the Red is Miguel’s Pizza, and their pizza is delicious. The variety of toppings is amazing, and of course you can top off your meal with a healthy dose of Ale81 — the local soda of choice. After Miguel’s, we headed back to our campsite. We were lucky enough to find a deserted and well-maintained campsite (sorry, not divulging the location of that one!) during Memorial Day weekend. It was quiet, close to choice climbing areas, and had a covered picnic table, a recently cleaned/emptied portapotty, and nice areas for setting up your tent. 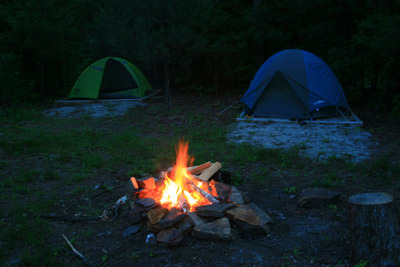 And since it was privately maintained, campfires were allowed (as you can see in the picture below). It was a fantastic weekend, and one that I’ll not soon forget due to the multitude of mosquito bites peppering my limbs.